Antiphon: Lord, send us your Spirit and renew the face of the earth. that you are looking at me and listening to my prayers. You are so great and so holy: I adore you. You have given me everything: I thank you. I have been so ungrateful; I ask your pardon with all my heart. You are so merciful: I ask you all the graces which you know are beneficial to me. Before reading the Scripture: Jesus Christ our Master, you are the Way, the Truth and the Life. Pour out on us your Spirit, as you did on the Apostles, gathered together in prayer with Mary at Pentecost. Open our hearts to receive your Word with the humble docility of Mary and in the spirit of the apostle St Paul, so that it may bear abundant fruits of holiness and dedicated service also in our life. Reading: When the time for Pentecost was fulfilled, they were all in one place together. And suddenly there came from the sky a noise like a strong driving wind, and it filled the entire house in which they were. Then there appeared to them tongues as of fire, which parted and came to rest on each one of them. And they were all filled with the Holy Spirit and began to speak in different tongues, as the Spirit enabled them to proclaim. Silent Reflection: What does this passage from the Acts of the Apostles say to me, to us, today? R. Come, Holy Spirit, source of light! 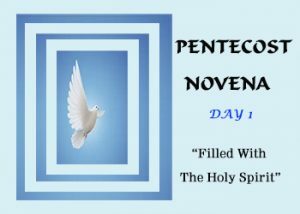 Come, Holy Spirit, source of strength and joy, of forgiveness and peace. Come! Fill the hearts of your faithful and enkindle in them the fire of your love. V. And you shall renew the face of the earth. Hymn to the Holy Spirit. Prayer: All-powerful God, Father of our Lord Jesus Christ, send your Holy Spirit upon us to be our helper and guide. Give us the spirit of wisdom and understanding, the spirit of right judgement and courage, and the spirit of knowledge and reverence. Fill us with the spirit of wonder and awe in your presence. We ask this through Christ our Lord. Amen.